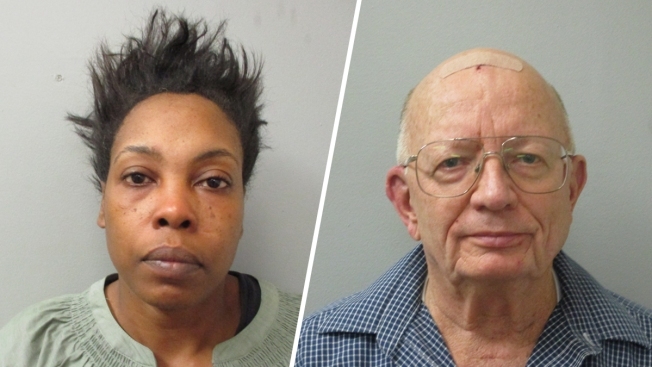 Mugshots from the Huntsville Police Department show Chequita Jenkins (L) and John Chapman (R). Alabama police say a dispute over crab legs at a dinner buffet ended in a brawl that left two people facing misdemeanor charges. Huntsville police officer Gerald Johnson says he was eating at the Meteor Buffet restaurant when a fight broke out. Johnson tells WHNT-TV that diners were using service tongs like fencing swords and plates were shattering, and a woman was beating a man. Johnson says diners had been waiting in line for crab legs for more than 10 minutes, and they lost their tempers once the food came out. The station reports Chequita Jenkins is charged with assaulting John Chapman, who suffered a cut on his head. Chapman is charged with disorderly conduct. Court records aren't available to show whether either person has a lawyer.